Barn Cat Oil on wood, 8" x 8," $330. ...just taking a sleepy ride through the country on the back of a grandfatherly sheep. 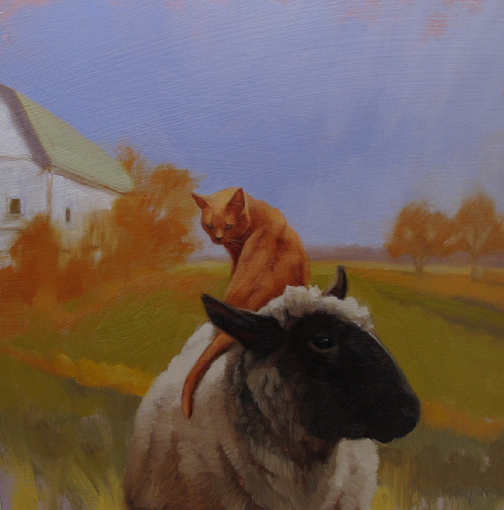 "Barn Cat" is another in my "Beast of Burden" paintings. I keep coming back to these... Painting the animals so they look companionable (1) and (2) placing them in a convincing and complimentary landscape is a mighty challenge! 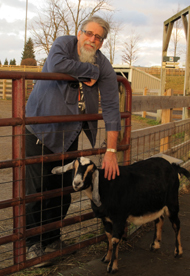 Also pictured, handsome husband who accompanied me on a shoot at Farmpark in Kirtland, OH. One of my favorites in this series!!! Love the position of the cat! Love the principal subjects and I'm a big fan of your landscapes. The goat looks like she's posing with your cute husband!